GM has been using Seegrid robots at its Detroit-Hamtramck plant since 2016 and could expand them to other plants. While Tesla CEO Elon Musk has been laying out a futuristic vision of highly automated, human-free car factories staffed by robots, it's the legacy auto industry that's quietly putting a version of that vision into motion. Automating the manufacturing process is one way to use developing self-driving technology to cut costs and increase efficiency. In September, Musk referred to plans for a completely self-operated plant, calling it the "machine that builds the machine" — or more ominously, the "alien dreadnought" — capable of a twentyfold increase in production speed. Musk is counting on such productivity advances to achieve his goal of large-scale production. Seegrid, however, is working toward a shorter-term, more collaborative goal. "What we're focused on is economic improvements that can be made through automation today," said Jeff Christensen, vice president of products and services for Seegrid. He added that while automation will cost some manufacturing jobs, it has created new opportunities for "path planning" and troubleshooting. Seegrid's camera-equipped robots start off with a human operator who drives the vehicle along the desired path while it's in "record mode." Once the route is recorded, the robot can drive on its own. As it travels, it compares its surroundings with the stored images to avoid unexpected obstacles. Christensen said the vehicles cannot be remotely controlled, and any path changes or additions must be added by a human driver. This closed-loop system limits access points for cybersecurity breaches and keeps the robots from running amok, WALL-E style. The self-driving robots have proved to be more consistent and predictable than human drivers, improving both efficiency and safety, Christensen said. Seegrid's robots have driven 650,000 automated miles with no incident. GM started using the automated vehicles in its Detroit-Hamtramck plant in early 2016 and has since increased its fleet to more than 75. The companies are in talks to expand the use of the robots to other plants, Christensen said. 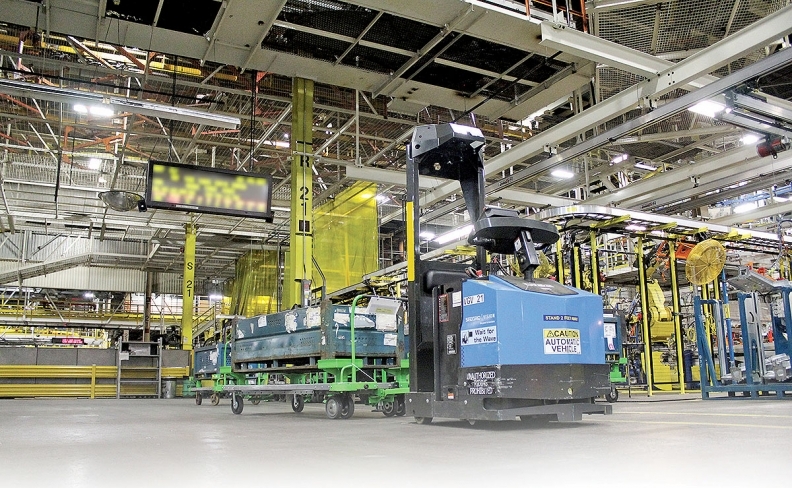 A GM spokesman said the robots are used to deliver bulk body-shop and general-assembly materials. "They are one of many manufacturing technologies that provide us with flexible material delivery solutions and enable us to keep our workers safe," he said. Not every automaker sees factory automation as an improvement. In 2014, Toyota began replacing some of its manufacturing robots with human workers to keep a more perceptive eye on quality. "We cannot simply depend on the machines that only repeat the same task over and over again," Mitsuru Kawai, an executive vice president who oversees Toyota's plants, told Bloomberg then. "To be the master of the machine, you have to have the knowledge and the skills to teach the machine." Christensen said he's unsure if the long-term future will look more like Musk's alien onslaught or Toyota's more human-centric model. But in the near term, he says, partial automation may be automakers' best bet to wring out savings. "Cost competition has put enormous pressure on the auto industry," he said, adding: "Automation is necessary."